The Cooper Union Library has launched its next big phase in the long-term project of making important institutional archives freely available via the web by digitizing the first 21 extant annual reports of the institution, spanning Peter Cooper's lifetime. (Four reports are missing from around the time of the Civil War; not even the Library of Congress has copies.) The first two annual reports went online in early February and each week sees additional reports added. They hope to complete this phase by the end of the month. "We have been anxious to digitize the annual reports as they are the key historical record of the founding of the institution," Carol Salomon, Acting Director of the Library and the archivist of the Cooper Union papers, says. "Up until the 1920s the annual reports contained information about the students as well as the business of the institution, making them critical resources for information," she says. After uploading the 21 reports from 1860 to 1884 the remainder will be digitized as time permits. 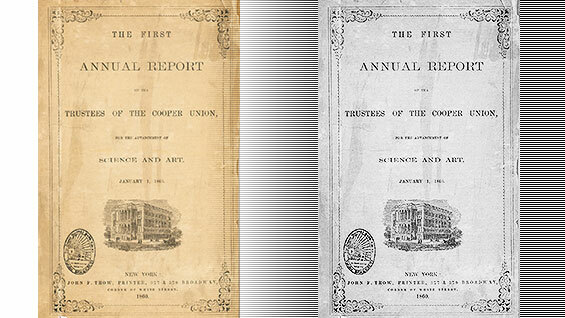 "The annual reports are a rich record not just of Cooper Union's internal history but New York civic culture in general," Peter Buckley, an Associate Professor of the Faculty of the Humanities and Social Sciences, says. Prof. Buckley has become the unofficial school historian and is at work on a book about the history of education at the Cooper Union. "The more scholars have access to these reports the better they will understand what civic life was like," he says, "Cooper might be special but it is also prismatic of what else was going on in the city." Because official registration records are often missing from the early days of the school the reports can be the only way to confirm if a student attended, a subject of interest to genealogy hunters and academics who up to now have had to go through microfilm to find the answers. Besides making the reports available to anyone with web access, the digitization project will allow a full text search across all the reports simultaneously. Each document gets scanned and then run through a sophisticated optical character reader that recognizes text, creating a searchable digital facsimile that, after being carefully proof-read, gets uploaded to the web with standardized metadata. Julie Castelluzzo, the Electronic Services Librarian and an 18-year veteran of the library, coordinates the process that involves a team of four library staff members. Quality control is very high, due to both the immediate and long-term value of these documents as tools for researchers both within the Cooper community and around the world. "The goal is to get it exactly right." Castelluzzo says. While she has gotten offers of assistance from interested external parties, she says, the work is handled in-house exclusively, due to the delicate condition of the original documents, the need for familiarity with the content and the need for knowledge of best practices and standards for digitization of archival works. "The annual reports show a very innovative institution in formation, learning through success and failure," Prof. Buckley says. He cites the recorded debates over improving the technical program and the shelving of a planned natural history museum as examples. "The reports show the imaginative reach of the original trustees in hoping to design an institution that will serve the needs of the city," Prof. Buckley says.